So, today’s comic has an interesting back story. Originally, this was suppose to be the start of the comic story that I was going to do. Basically it all revolved around one joke where ‘Princess Peach’ gets kidnapped by guys dressed up as mushrooms and the heroes have to go after her. However, after a few comics in, I realized that I just couldn’t keep the art up to my very high standards…lol…so it was during a rather lucid dream that I came upon the idea of Miller’s immortality. I seriously did all the comics for it in one day, aside from the next to last one. Anyways, here’s the comic. Enjoy! wait a minute, Who’s who? Aww, I’m sorry Cody. I’ll tell you what. 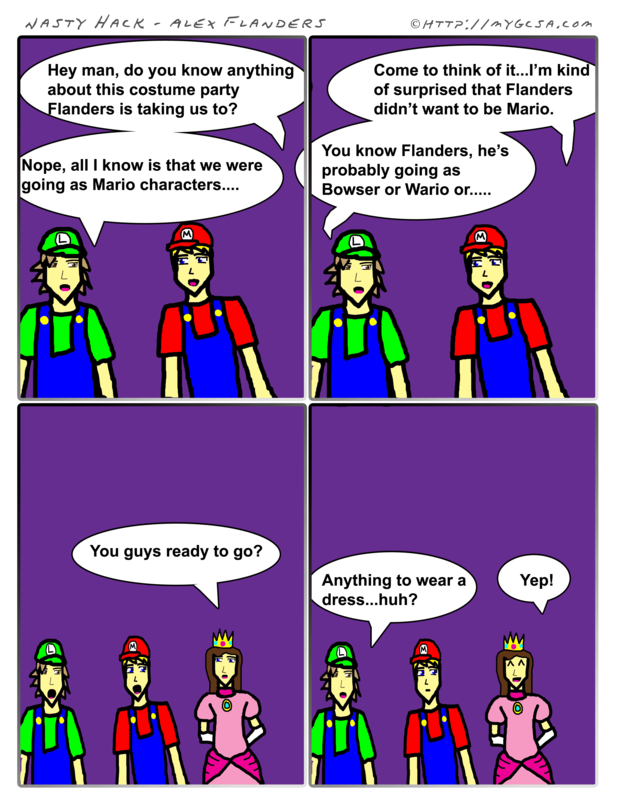 For the NH Halloween comic, you shall be an epic Luigi!